Like BOV800XL and BOV450XL, Breville BOV650XL Compact Smart Oven 1800-Watt Toaster Oven is a black horse in the race of compact toaster ovens residing on the countertops. Breville BOV650XL fits the ultimate power of 1800 watts into this compact product which gives you the most even cooking and baking experience you have ever had. Equipped with smart technology this toaster oven has the capability to remember your most used cooking setting and saves your time by avoiding choosing the same settings again and again every time you come for cooking. The smart Element IQ technology makes the oven put the right amount of heat at right places and at right time. Its individual heating elements help this variation of temperature. This oven also remembers the settings you make and save it for frequent use. Unlike its counterparts, this 4 slice oven has the space to bake a 12″ pizza which is not an option for other 4 slice toaster ovens. The only one of its kind oven that comes with not two, three or four but eight cooking and baking modes which include Toast, Roast, Bake, Bagel, Broil, Cookies, Pizza and Reheat. Other attractive features include dedicated buttons for defrost and temperature conversion between °C and °F. This model also includes an attractive back lit LCD for information display. The LCD panel has different background colors to indicate the oven is in use or not in use. What Do Owners Say About The Breville BOV650XL Compact Smart Oven? Like other “compact” toaster ovens, I hope you make clear that the compartment of this compact oven is small for a number of foods like a simple full size loaf of bread. Elements IQ – Compared to other countertop toaster ovens, the major upper hand of this oven that owners love is its new cooking technique introduced by Breville by name of Elements IQ. The oven has individually controlled heating elements provided with an 1800 watts power to give the best and most evenly distributed temperature for sections of oven compartment. Unlike convection technology, the elements IQ makes varying temperature conditions where required for better cooking. Excellent Customer Service – The Breville customer service outclasses other brands and owners praise that they even refurbish the whole product if you report a serious issue within the limited one year warranty period after your purchase. They does not simply disown their product like most of the companies these days, instead they own their creation and the customers’ trust as well. 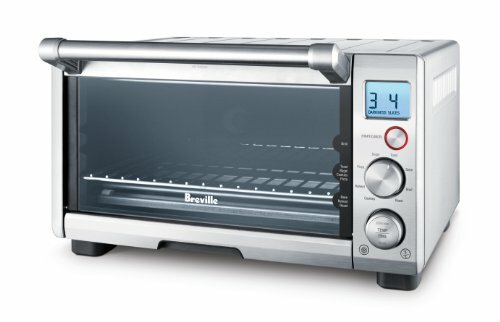 Precise Timer – The timer is a precious accuracy tool used by Breville in this 650XL Smart oven. You can achieve maximum precision for required time of baking recipes and watching through glass door enables overseeing during baking to avoid over cooking and burning. The timer also adjusts itself for baking if the oven is already heated up; so as to avoid burning and over cooking of food. It won’t annoy you like other toaster ovens with ticker timer. Intelligent Memory – The smart technology of this compact oven saves your most used settings and enables you to start cooking or baking right away without wasting those extra minutes in setting up your required conditions every time you come to cook or bake the same recipe that you do every day. Owners love it saving them a lot of time. Easy to Use – Most owners love its convenient details. The door is very fluent in opening and closing. The rack comes out easily. The removable tray is a blessing when you are cleaning this toaster oven and the material of the trays is of high quality enameled sheet. Tray – The first important issue you need to take care about while using this toaster oven is that its tray does not slide out a few inches automatically like the other ovens when the door is opened; so you have to be careful while taking out the food. Timer – The timer function is a good thing for automatic adjusting according to temperatures, but it is not at all useful for someone who wants to manage the time and heat according to customized settings for any recipe. LCD – Another reported issue about this oven is the LCD it has; the digits are barely visible at times and you have to watch closely. Feet – The rubber pegs on the bottom feet are not very good in design; while you are opening the door the oven sort of slides so one should take care while doing so with hot food inside. Overall this oven is a good choice although it may cost little extra dollars because of its smart technology and Elements IQ. It’s a lovable product and easy to use once you get familiar with the controls. It has a high rating, although may not as extremely high as BOV800XL and BOV450XL, it still has better performance than other compact toaster ovens. However if you are willing to spend a few extra dollars, the full version of the same model is something worthwhile with improvements.